KATHMANDU, Jan 21: The Development Committee of parliament on Friday tabled a report on implementation of its decisions and directives given to government agencies in the House meeting. According to the committee's Chairman Rabindra Adhikari, it is the first time any House committee has tabled its monitoring and evaluation report in the full House for discussion. The committee decided to table the report in the House as it found the government agencies reluctant to implement its decision and directives. 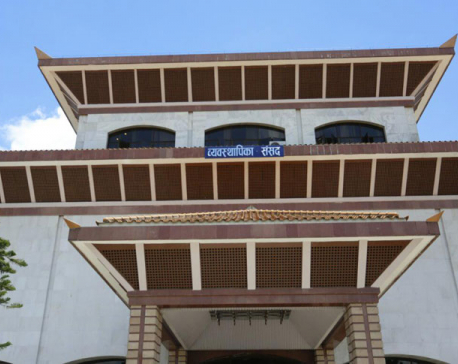 Speaking at the parliament meeting on Friday, lawmaker Adhikari said that the government agencies have failed to implement the directives and decisions of the committee in absence of coordination between them. "The government is able to spend only 11 percent of capital expenditure allocated in the annual budget. Even the decisions taken on this regard by the House panel from a meeting attended by Prime Minister and concerned ministers are not implemented. The government has failed to implement its own policy and programs," said Adhikari. "In this situation, it is obvious for us to be in the list of least developed countries," he added. Adhikari criticized the ministers for their indulgence in inauguration and laying foundation stones of development projects rather than focusing on implementing and completing the development projects. "In the past three years, construction projects of 96 bridges were either inaugurated or foundation stones were laid but all the projects, which were to be completed in two years, have either not started or are yet to be completed. Around 3 dozens projects, which started almost seven years ago, are yet to achieve significant progress," Adhikari presented statistics in the parliament meeting. "Ministers are less bothered about developing infrastructures but they have keen interest on laying foundation stones. Mainly, the progresses of long-term projects are dissatisfactory," he added. The Development Committee, which oversees the Ministry of Physical Infrastructure and Transportation, the Ministry of Information and Communications and the Ministry of Federal Affairs and Local Development, has given as many as 13 directives alone to the Ministry of Physical Infrastructure and Transportation on expediting various development works in the current fiscal year. But the ministry is yet to implement a single decision of the House committee. "As we have tabled the committee's report in the House, other lawmakers will discuss the situation while the PM and ministers will be forced to answer the concerns we have raised," Adhikari told Republica after tabling the report.